The Irish Draught horse has plenty of substance but is also an attractive looking, well balanced, quality horse, with straight athletic action. It is noted for its intelligence and kind temperament and it has an inherent ability to cross the most testing of hunting country with total assurance and because of its jumping prowess is a successful producer of top level show jumpers. Since World War II, many of the worlds leading show jumping horses have been Irish bred, with a fair percentage being from Irish Draught stallions. One of the most famous names in show jumper breeding is King of Diamonds, an Irish Draught who sired many famous horses, including Special Envoy. Special Envoy has jumped with great success for Brazil, ridden first by Nelson Pessoa then his son Rodrigo and Mill Pearl ridden by the United States Olympic Champion Joe Fragis. 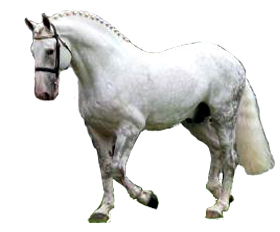 Physical Attributes of the Irish Draught horse breed. Colour Range: All solid colours. Strong limbs with plenty of flat bone and no feather. Irelands draught horse dates back to Norman times when imported horses were crossed with smaller native animals. Later crosses included Andalusian, to produce an all-rounder suitable for riding, pulling a trap or working on a small farm. Now renowned as a heavyweight hunter, the Irish Draught is often crossed with the thoroughbred to produce quality hunters and competition horses.